As NaNoWriMo approaches (that is, National Novel Writing Month, November 1-30), I thought it a good time to answer a question a dear friend asked of me recently: What is a novel, actually? What defines it compared to other books? Well, I know what it is, but I have never really articulated it or looked up an official definition. NaNoWriMo is a non-profit organization that runs what is essentially a month-long writing contest, along with several other programs “to empower and encourage writing and vibrant creativity around the world.” Their goal is for 50,000-word novels, “about the length of the Great Gatsby,” which they believe is a challenging but doable length even for people who work full time and have children. Some people categorize novels into three categories: literary, mainstream or genre. Literary tends to deal with large world issues within the context of story. These novels are intended to make you think about these issues in a new or deeper way. Think Hemingway, Orwell or Dostoyevsky. Mainstream novels? I have yet to find a reasonable definition. Apparently it is a work of fiction that does not fall into the genre categories and also does not deal with issues in a way that would make it literary. Huh? Don’t ask me. I also found a definition that says it is any novel that sells well. Why does that make it a separate category? Because it appeals to a mass audience? Dan Brown’s The Da Vinci Code is part history, part thriller, part suspense, and pretty much everybody read it. So there you go. Genre novels fall into specific categories such as romance, mystery, thriller, horror, humor, westerns, science fiction, fantasy, and my favorite, historical. There are crossovers, as in one of my favorite novel series, Outlander, which combines well-researched history with romance (Jamie Fraser lovers will know what I mean) and fantasy, because it involves time travel. Then there’s the novella, which is pretty much what Stephen King says it is. (Just kidding…) It is basically a short novel, falling in the 20,000 to 50,000-word range, and fitting into any of the above categories. Word has it that agents and publishers don’t really know what to do with these things unless you are in fact Stephen King, or someone who has his fan base, and then they would feel secure that they could sell it. I applaud the NaNoWriMo goals to encourage and stimulate writing, but I must say the idea that a novel can be written in a month is beyond me. Maybe I could accomplish a very rough and simplified first draft (aka outline), but I believe a good novel requires deep thought, research, multiple points of inspiration, writing and rewriting, editing, and then a lot more of the same. That said, if you are of the mind to try the November writing challenge, I say GO FOR IT, and refer you to a fellow author and blogger Alexandra Sokoloff’s post about October being a good time to prepare. She offers some good tips for getting started. Happy fall, and happy writing! 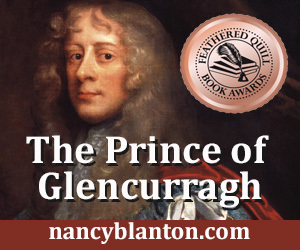 Nancy Blanton is author of Sharavogue, the award-winning novel of 17th century Ireland and the West Indies. Find it today on amazon.com, barnesandnoble.com, or iTunes for iBooks. Her second novel is to be published in 2016. Please follow this blog for updates!